If Giselle, which sees a peasant girl die from despair when she realises that her love for a nobleman can never be, is as sad as any ballet ever written, La Fille mal gardée (The Wayward Daughter) stands at the opposite end of the spectrum in being as light-hearted and comical as they come. It sees the young farmer Colas desire the hand of Widow Simone’s daughter Lise, only for Simone to insist that she marry Alain who is something of an upper class twit. If we can’t help but feel just a little sorry for the latter as he loses out in love at the end, this only introduces an extra dimension to what is ultimately a riotous comedy. 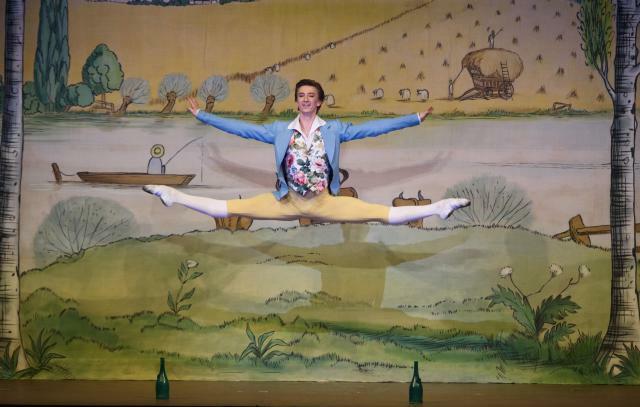 Although the very first La Fille mal gardée appeared in 1789, the version presented here is Frederick Ashton’s now classic production of 1960, which features John Lanchbery’s arrangement of Ferdinand Hérold’s much older score. The sets are ‘two-dimensional’ so that the clocks and stag’s heads that decorate Widow Simone’s house are painted directly onto the walls. There is, however, a glorious intelligence underlying their conception, courtesy of the skills of their designer, the cartoonist Osbert Lancaster. The subject matters of the featured paintings are emblematic of his deft wit, while the external farmyard set includes cockerels roosting in a tower and dead crows nailed to the barn. The ballet’s opening could not be more delightful as Michael Stojko’s Cockerel rises en pointe and kicks a leg forward to form a right angle with his upper body. He is joined by an ensemble of four hens who together strut, march, leap and flap their wings with such dynamism that we soon forget how difficult it must be to move in the thick, feathery costumes. As we positively engage with every joyous step and breath-taking move, the brilliance of the dancers becomes very apparent. As a comic ballet, many of the movements required of the limbs are bolder and more frenetic than in other dance pieces. This makes the achievement of the cast to carry them off with such smoothness and grace all the more exceptional. 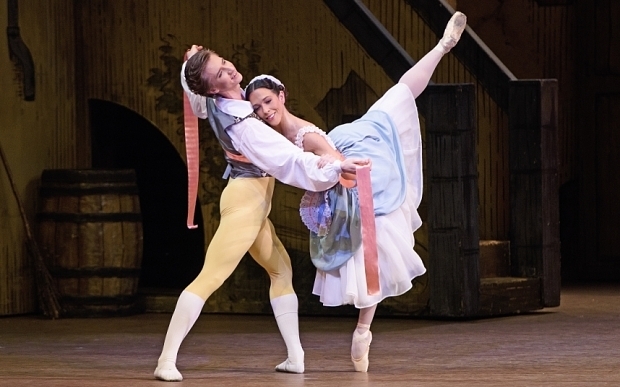 As Lise, Laura Morera brings excellent shape and style to her movements and has a cleanness of technique that enables us to be overwhelmed by her dancing while still seeing her as a humble peasant girl. As Colas, Vadim Muntagirov possesses a brilliant light athleticism that enables him to cut through the air with mesmerising agility and yet the minimum of fuss. He also has a sensitive persona that really makes us want to see him succeed. Will Tuckett as the blustery, and frequently flustered, Widow Simone, cannot help but remind us of Terry Jones’s mother figure in The Life of Brian. Dressed in drag, he clearly has a whale of a time as he dances on his heels (a milk churn having just landed on his foot) and delivers a stunning set of cabrioles. The undoubted highlight, however, is the famous clog dance in which his embellishments and deliberate mistakes, quite rightly, bring the house down. Paul Kay captures the puppet-like nature of Alain’s persona, as he dances like a clockwork automaton and convincingly portrays a galloping horse with just an umbrella to complement his exceptional movements. Gary Avis is equally effective as Alain’s father, while the corps de ballet enthuse the audience with their riotous may polling, morris dancing and tilling of the soil. It is possible to go to La Fille mal gardée every few years, and to emerge each time thinking ‘I’d forgotten just how good it was’, but on this occasion we genuinely believe it is even better than usual. If for any reason you can’t make it to the Royal Opera House, the live cinema screening on 5 May should provide a welcome alternative. Until 5 May (eleven performances, various start times) at the Royal Opera House, Covent Garden, London WC2E 9DD. Casts vary over the run. For further details and tickets (£5-£97) visit the Royal Opera House website. Londonist saw this ballet on a complimentary ticket. La Fille mal gardée will be broadcast live to selected cinemas in the UK and worldwide on 5 May, with some encore screenings occurring over subsequent days. For full details of all screenings in the Royal Opera House’s 2014/15 season visit the Royal Opera House live cinema season page.